The winner of the book Raising Respectful Children is Amy B. Thanks, everyone, for your thoughts about good manners and kids! Currently we’re on a Rummikub kick. This was a fairly recent addition to our game collection, and it is a lot of fun. It contains numbered tiles that you arrange in sets and runs. For additional fun, you can rearrange any set or run to form different sets and runs. This hugely increases your playing options on any given turn, and it really lets you think creatively. Sometimes the girls and I try to rearrange so much that we get stuck, forget how we began, and then can’t put things back the way they were before a turn. Good fun. This game is suggested for up to 4 players age 8 and up, but I would suspect that most 6 year old children could play with a bit of coaching. A whole game takes half an hour or so. Another game that has been a favorite of ours for quite a few years is Ticket To Ride . This game is played on a US map, with the goal of building train lines from city to city. Up to five players can play together, and the more people on the map, the more crowded things become. Part of the fun of the game is blocking other players from reaching their goals, sometimes causing opponents ridiculously long detours to go short distances. This game often takes an hour or more to play, and is done when one person uses up all their trains. I’ve told you before about Dutch Blitz, Unlike the previous two games I mentioned, there’s no turn-taking in this game. It is a wild card-stacking free-for-all. A standard deck allows four players to play at once. If that’s not crazy enough for you, mark a second deck, and play with up to 8 players for utter craziness. I have to be in the right mood to do well at this game. It is truly lightning-fast with a big group, and if you’re a little sleepy while playing a bunch of teens, you will be left in the dust wondering what just happened. This game can easily be learned by any child who recognizes numbers, but younger siblings sometimes get frustrated trying to complete with speedy older siblings. We occasionally handicap speedy older kids (by giving them more cards on their Blitz pile) to give younger ones a fighting chance. But mostly we let the cards fall how they may, and gradually the younger ones get quicker. A game can often take 5 minutes or less, so this is a great choice for some fun when you have just a bit of game time. Spot It consists of 55 cards that create a free-for-all matching game. (Is it only kid-at-heart me who adores games where you don’t have to wait for your turn??) There are four ways to play, and you can play with 2-8 players. This is definitely a game most interesting to younger kids. The instructions put the minimum age at 7, but I’d say it is more like 4, especially once kids learn the names of the various shapes and pictures used for matching. There are multiple pictures in varying sizes on each card, and I’ve found that my kids are often better at this game than I am– something they enjoy greatly. Each game is done quickly– usually in 5 minutes or less– perfect for young ones with short attention spans. No game list would be complete in my book without a mention of Phase 10. This game consists of ten different ‘phases’ with a different goal in each phase. It takes about an hour to run through completely, though if we have limited time we sometimes just play to phase 3 or phase 5. It works well for kids who are age 8 or older. What games do you like to play with your kids? I’d love some more suggestions. 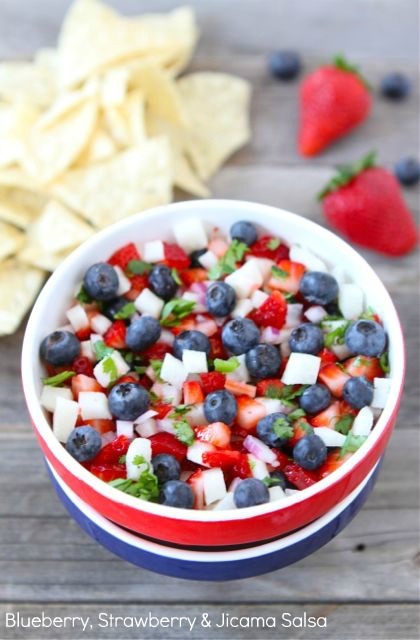 I’m looking forward to our annual 4th of July family party, and have been bookmarking some ideas that I’m thinking about trying. Click on each photo to go to each tutorial. 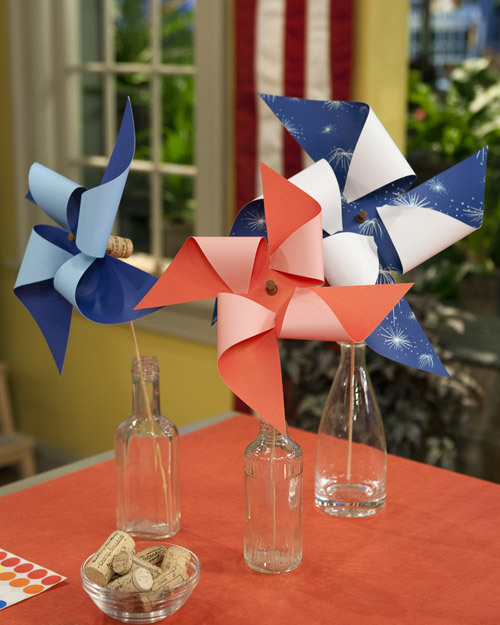 These pinwheels look like fun to make, and they’d delight the little grandsons! We might use heavy drinking straws instead of skewers though. 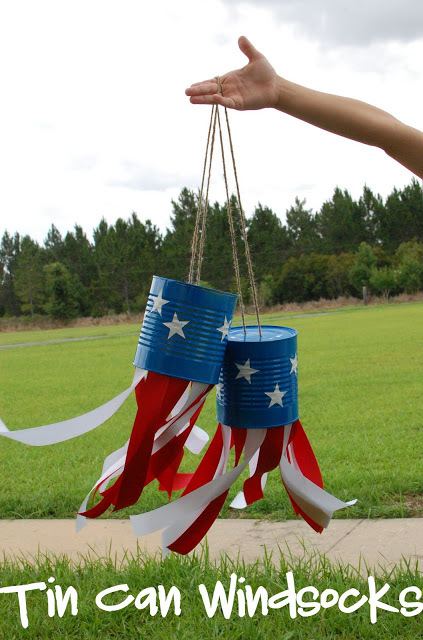 Aren’t these tin can windsocks just adorable? I think they’d be fun in the tree over the swimming pool all summer long. For the streamers, I’d probably cut strips off some cheapo plastic tablecloths you can get from a party store. That way they will be able to withstand rain. This salad looks so pretty and yummy. Also, I’ve never bought jimaca before in my life, so it’s about time I do! I’ve used this idea in previous years but in individual glasses, which has always felt a little too fussy with the numbers of people I serve. I love the idea of setting it up in a big dispenser and letting people serve themselves. 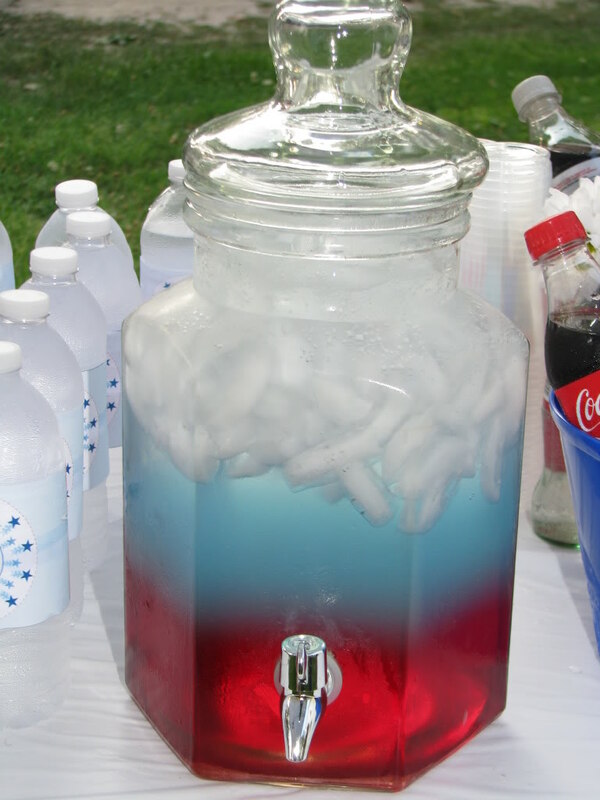 It might mix up a bit while being dispensed, but it would still taste as good. Here’s one last decor idea. Even if you decided not to do the lettering, the stars suspended on ribbon are a lot of fun. This idea would be fun birthday decor too. Finally, if you’re looking for games for a large crew, be sure to check out the post I wrote awhile back detailing some of the games we’ve played over the years with varying ages of people. 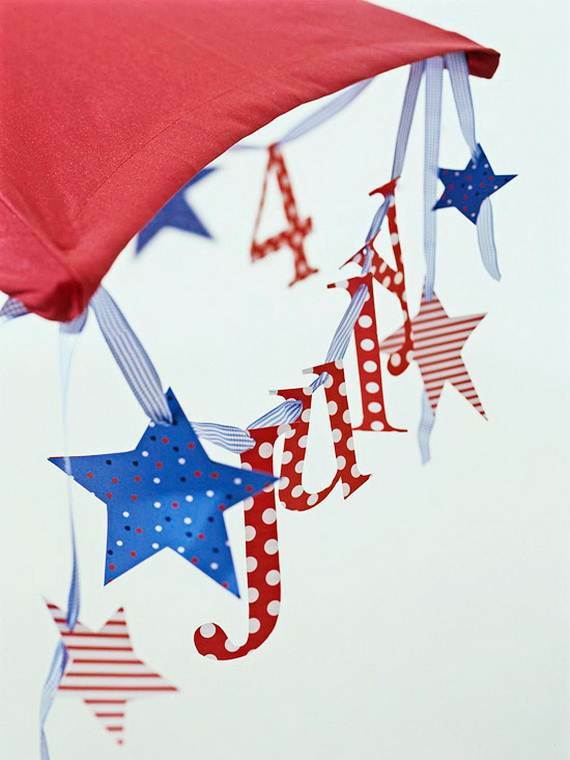 Do you have plans for the 4th? As many of you know, my ‘baby’ sister is currently living in Ethiopia doing medical mission work. Each time she comes to America on furlough, knowing what a coffee nut I am, she brings me some of THE best coffee in the world. It’s an Ethiopian brand called To.mo.ca, and it is sooooo delicious. I’ve posted before about the work that Bring Love In does in Ethiopia. The founders, Levi and Jessie Benkert, had the idea to bring widows and orphans together into family units, to provide the orphans with mothers and the widows with support to live and raise these children. It is a fabulous idea, one I am so excited about. I hope that if you haven’t already, you’ll go to their website and read about their work. Adoption is a solution for some kids. But we need to be thinking of more ways to help orphans that don’t involve them having to leave their country of birth, and this is a wonderful example of how this can look. So– what do To.mo.ca and Bring Love In have to do with each other? Well, some people who are fans of both have brought them together. A website called World’s Greatest Beans sells the coffee and donates part of each sale to Bring Love In. To bring some attention to this new business, I’ve been authorized to give away three pounds of this yummy coffee! Here are three ways you can enter the drawing. 1. Go follow World’s Greatest Beans on twitter and come back here and tell me you did so. 2. Like World’s Greatest Beans on Facebook and come comment again. 3. Pin this post on Pinterest or like this post on Facebook (use the buttons below)and comment AGAIN to tell me you did so. Yes, if you want three entries, you’ll need to comment three times! But the winner of this giveaway gets THREE pounds of coffee, so you can see, it is totally worth it. 🙂 I’m going to give you a full week to enter this fun drawing. Even if you’re not a coffee fan –, yes, I GUESS we can still be friends… 😉 –I hope you’ll consider using social media to tell folks about this great way to bless widows and orphans in Ethiopia. It is very worthy work! The winner of the $100 Shell gift card is Margaret Smith. Congrats, Margaret! The winner of the ARC notebook is commenter #78, Chantel. We’re having a busy weekend here. A picnic with all my siblings today was great fun– the weather was perfect, and the cousins (and all the grownups!) had great fun hanging out. In the past few days John and I also finished a new shadecloth cover for our back patio. I’ll show it to you next week! The winners of last week’s cookbook giveaway are Katy (Purposely Frugal) and Liza. Email me your addresses, gals, and I will get the cookbooks headed your way. I’m excited about a giveaway I have for your today! Awhile back Staples sent me a sample of the Staples ARC organizer notebook. 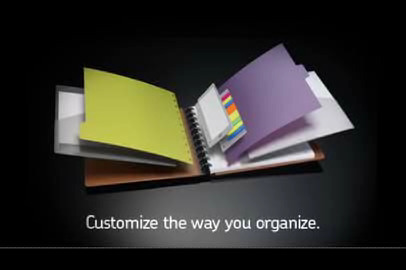 If you click on the link, you’ll see the many ways you can customize this notebook. There are various colors of leather, some cute patterns, and lots of neat additions like pocket pages, colored dividers, various styles of paper, and even page flags. My dividers are currently marked: blogging, writing, menu/shopping, budget, and checkbook. I have been bringing the notebook with me everywhere. Wherever I am, I can jot down grocery and menu ideas, peek at how I’m doing with this month’s budget, jot down blog post ideas, or write notes about things I need to get done during the week. I especially like the task pads that I can stick anywhere in the notebook and then remove when I’m done with that particular task or list. I always get more done when I take time to make out a to-do list, and this notebook makes organizing practically effortless. Today I’m giving away one Staples ARC organizer notebook along with a cool Avant pen. All you have to do to enter the drawing for this giveaway is tell me a few things on your own to-do list this week. For an additional entry, mention this giveaway on Facebook or Twitter, then come back and comment again. I’ll choose a winner on Friday! This couple is so much fun! Love it! For Girls Like You is a magazine written for girls age 6-11, and shares stories about interesting places, positive role models, and creative projects, without the negative imagery and advertising that often appears in mainstream entertainment. The creators want this new magazine to entertain and inform young girls in a God-honoring way. 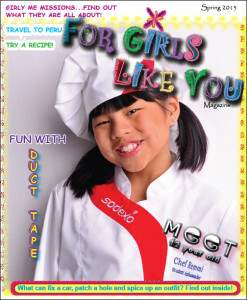 Each issue features many opportunities (called Sprinkles) where they ask girls to contribute their own thoughts and ideas. I was sent two issues of this new magazine, as well as a copy of their ‘maga-book’ which features lots more stories, crafts, writing prompts, and activities. My 8 and 10 year old daughters have been poring over the magazines ever since they arrived a few days ago, and have really enjoyed the various features and stories about people. My teen daughters have also spent some time checking the magazine out. I love that the magazine features girls of every color in a very balanced way. Too often magazines feature endless blonde white girls, with a light brown girl tossed in there every now and then as a nod towards folks who aren’t pale-skinned. My girls especially enjoyed the feature about Jamie-Grace, who is one of their favorite singers. This week I’m giving away a one-year subscription to For Girls Like You to one of my readers. Enter the drawing by commenting below and telling me a little about the girl you’d like to give this magazine to– what does she like to read about? What kinds of activities does she like to do? (I’m sure the editors of For Girls Like You would love ideas for future issues!) If you’d like an additional entry to this giveaway, go ‘like’ For Girls Like You on Facebook then come back here and comment AGAIN, telling me you liked them. Bonus points if you write on their wall and tell them where you heard about their magazine! I’ll choose a winner on Friday! I’m not sure what exactly inspired me, today, to clean out my entire walk-in closet. I threw a bunch of my old junk away, put a bunch of old albums in storage bins in the garage, vacuumed, and then cleared one whole side of the closet so I could shove one of our dressers into it. 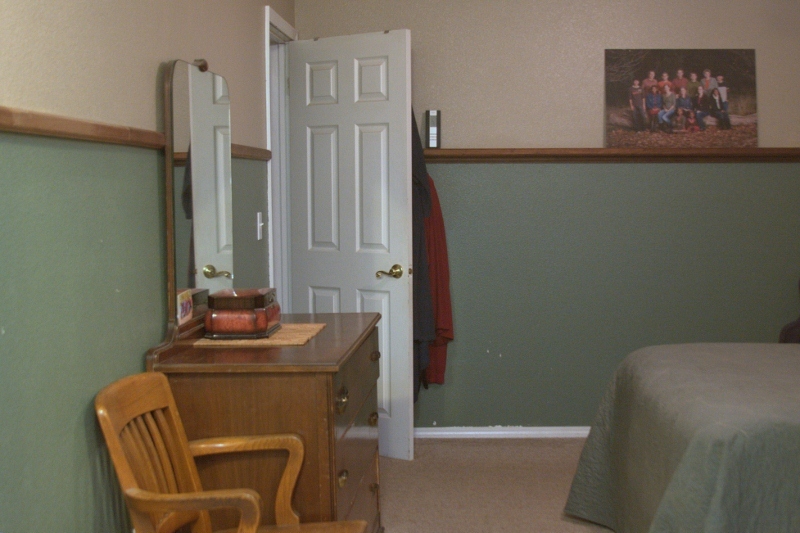 I think the plan began with the wish to have our bedroom look more spacious. But it was one of those projects that I began with gusto and ended with a whimper. It took SO LONG to sort all the randomness that had lived in our closet for years. Question: is it really essential to save pre-2008 tax returns? I did, but I was so tempted to toss them! And what about my high school diploma? I’m pretty sure I’ll never need it. See, it’s these kinds of decisions that make decluttering take forever. 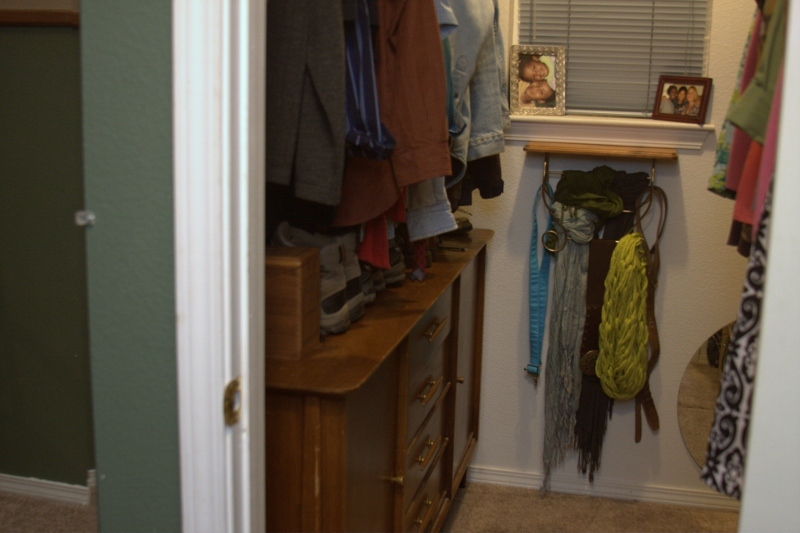 Here’s a look into the closet– the dresser actually fits there pretty decently, and will fit even better once I switch out a shelf bracket above it that’s keeping it about 3 inches out from the wall. And here’s a look at the wall that used to house the dresser. Now there’s only ONE dresser on that wall instead of two. It was just too much altogether, and that side of the room now looks much less cluttered. I love it– here’s hoping my hubby does. My furniture-moving proclivity makes him sigh some days. I’m always mixing things up, trying to find ways to make things work better. I figure a hobby that only requires elbow grease and a vacuum cleaner can’t be all that bad, whereas he kinda just wants to know where his socks are. (Same place as always, hon!) And his seed catalogs. (In the magazine rack by the door.) And his shoes. (In the closet.) Bless the man for putting up with my ‘improvement’ gene. I am a trial some days. What about you? Are you a furniture-shuffler? Or do you just pick the perfect spot and leave it be? I also wanted to tell you who won the two books I’ve given away in the last week. Puria goes to commenter #14 -ginny jolin, and Sparkly Green Earrings (releasing TODAY!) goes to commenter #20-Kaeteh. Email me with your snail mail addresses, folks, and I’ll get those books headed your way.